Two McDowell women were charged after deputies responding to a report of a suspicious person found meth on one and drug paraphernalia on the other, authorities said Friday. 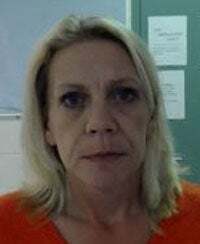 Deputy Steven McPeters of the McDowell County Sheriff’s Office charged Jennifer D. Clarkson, 45, address listed as Windy Hill Drive in Old Fort, with possession of methamphetamine and possession of drug paraphernalia. McPeters also charged Melissa Greer Lewis, 48, address listed as Tatertown Loop in Nebo, with possession of drug paraphernalia. At 7 p.m. on Wednesday, March 13, McPeters responded to a call of suspicious people at a store on Sugar Hill Road. He located the vehicle and found Lewis driving and Clarkson a passenger. Inside Lewis’s purse, the deputy found drug paraphernalia, and, inside Clarkson’s purse, he located drug paraphernalia and .60 gram of methamphetamine. Clarkson’s bond was set at $11,000. A picture of Lewis is not available. She was issued a citation.